(Budget Travel) -- Perhaps they're not the first place you think of when it comes to wineries, but these four regions offer character and great wine, without the hoopla. Stone Hill Winery is set high on the bluffs overlooking the Missouri River. In the mid-90s when oenophiles started to buzz about the region's Bordeaux-style wines, there were 10 wineries in Walla Walla. Today, there are more than 100, mostly accessible from Highway 12. With wine comes food, and gourmands like Alexa Palmer and Charles Maddrey have been pouring into town in the past decade. Two years ago, Palmer and Maddrey left their jobs as owner and chef, respectively, of an Italian restaurant in Renton, Washington, to open the Fat Duck Inn in the heart of Walla Walla. Each of the four guest rooms at their renovated Craftsman-style bungalow has a fireplace and a large tiled bathroom, and Maddrey can pack box lunches of gourmet charcuterie and cheeses, sandwiches, fruit, and dessert for picnics (fatduckinn.com, rooms from $125, lunch $13). The highway takes you back toward downtown Walla Walla, a preserved 19th-century Western town, where food options range from a burrito stuffed with beef, cheese, and local sweet onions at the Tacos La Monarca truck (509/522-2866, $5), to Turkish flatbread wrapped around spiced lamb and topped with yogurt sauce at Saffron Mediterranean Kitchen, whose chef was recently a semifinalist for a James Beard Award (saffronmediterraneankitchen.com, $13). Twisting from Cloverdale, California, to the Pacific Ocean, a 16-mile portion of Highway 128 passes through the organic apple orchards, olive groves, and redwood forests of Anderson Valley. Some of the more than 20 vineyards along the way supply pinot noir grapes for famous wineries in Napa and Sonoma, but you can taste similar vintages at the farm-style Anderson wineries -- minus the popped-collar crowds. Navarro Vineyards lets babydoll sheep (too petite to reach the fruit) graze under the vines, and free-range chickens wander the vineyards to help keep pests under control. Daily tours of the grounds and tastings of the star wines -- pinot noir and dry Alsatian-style whites -- are both free (navarrovineyards.com). About 10 miles northwest along the highway, gewürztraminer grapes thrive in the rich soil and foggy mornings at Lazy Creek Vineyards. Longtime owners of Sonoma's Ferrari-Carano Vineyards and Winery, Don and Rhonda Carano, acquired the rural estate last year (lazycreekvineyards.com, tastings free). Nearby, Husch Vineyards -- the oldest in the valley, and owned by the Oswald family -- has 10 picnic tables: some in the sun, some sheltered under vine-covered pergolas. Past an arch of roses, the family pours complimentary samples of sauvignon blanc and pinot noir in a century-old redwood tasting room (huschvineyards.com). Like their neighbors to the north, Bob and Linda Klein also run a vineyard and farm at LindaVista Bed & Breakfast in Yorkville (a separate wine region in the Anderson Valley). Each of the two huge suites in their 6,000-square-foot French Victorian-style inn comes with a queen-size bed, a separate sitting room with a daybed and trundle, a full bath, and mountain views (lindavista.com, $150). What the Hermann Wine Trail (hermannwinetrail.com) lacks in size -- there are only six wineries along the 20-mile stretch -- it makes up for in experience. The region has been producing vintages since the 1840s, before Napa had produced a single bottle. The Captain Wohlt Inn makes an ideal home base -- and not just because it's in the center of Hermann's adorable historic district. The breakfasts of upside-down apple French toast, three-cheese quiche, or baked eggs with turkey bacon and herbs are exactly what you need to prepare you for a day of sampling wines (captainwohltinn.com, from $75). Less than a mile away, the family-run Adam Puchta Winery gives free tastings in the estate's original stone house with wood-beamed ceilings. For many of the 16-18 wines, you'll get a bite of something to help you identify the flavors. A Key-lime shortbread cookie brings out the fruit flavors in the vignoles, a sweet white wine, and a piece of chocolate softens the tannins in the dry red Norton (adampuchtawine.com). The picnic tables on the grounds make the perfect lunch spot, so on the way to the winery, stop at husband-and-wife-owned Time for Pie to pick up some bratwurst sandwiches and one of the 15 kinds of homemade pie (time4pie.com, pie $3 per slice). 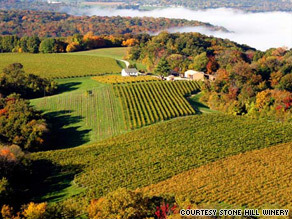 Two and a half miles down the road, Stone Hill Winery is set high on the bluffs overlooking the Missouri River -- one can imagine that the terrain reminded German settlers of their native Rhine River valley. Tours of the 162-year-old arched cellars, where wine is still stored, end in the tasting room, where you can try the chardonel, a dry, buttery white that's similar to a chardonnay, and the limited-edition vintage port. Virginia's premier wine country, dotted with working farms and over 1,000 acres of grape vines, spreads out around the city of Charlottesville in the foothills of the Blue Ridge Mountains. The free tour at 20-acre Jefferson Vineyards both explores the winery and recounts the history of Virginia wine making (jeffersonvineyards.com, tasting $5). The viognier, with aromas of honeysuckle and apricot, is an ideal refresher, and from the deck at the tasting room, visitors have a view of Carters Mountain and Jefferson's home, Monticello, a mile and a half north, where a recently opened visitors center introduces guests to the founding father's life and ideas (monticello.org, from $15). Jefferson's master builder also built Dinsmore House, a B&B just a block from the University of Virginia. The decor deliberately recalls the colonial era, but the amenities -- Wi-Fi and flat-screen TVs -- are right up-to-date (dinsmorehouse.com, from $109). South of Monticello is Kluge Estate Winery and Vineyard, whose 2005 blanc de blanc has hints of candied apple and lemon custard (klugeestateonline.com, tasting $10). About 18 miles west of Charlottesville, in Crozet, King Family Vineyards occupies 15 acres on a farm where polo ponies are raised; visitors can watch polo matches for free on Sundays from Memorial Day through the end of September (kingfamilyvineyards.com, tasting $5).